Getting lean is really hard work and there are no magical shortcuts! However, if you are willing to embrace this fact and put in the work (see my previous post The Truth About Getting Lean for details), then I have good news for you. Many people make getting lean harder than it has to be. There are some simple things you can do to make getting leaner faster and more effective. To lose fat you, have to be burning more calories than you consume. However, if you have a slow metabolism to begin with (especially if you have done your fair share of dieting in the past) you won’t be burning very many calories. To make matters worse, many people are far too sedentary outside the gym and when they do go to the gym all they do is cardio (which does nothing to raise your metabolism). As a result, to get into a caloric deficit, they can hardly eat anything. 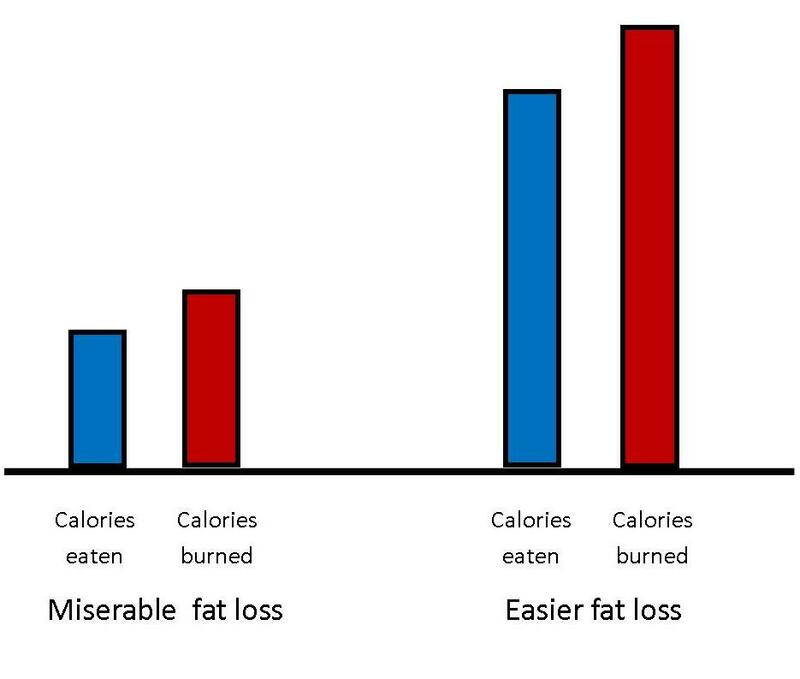 A better, easier and far more fun approach to fat loss is to be able to eat more food (and have a little more freedom with food choices) and still be able to burn it off. To do this, you have to focus first on getting stronger and actually building some muscle. You also need to train really hard on big, uncomfortable exercises in the gym so you burn lots of calories during and after exercise (see this post on EPOC for more info). Then, you need to adjust your daily lifestyle to move way more. Note: if you have been a dieter in the past see #7 in this post for more details on how to gradually fix your metabolism. Which way of getting lean looks more fun to you? I won’t work with a fat loss client or athlete who will not keep a food log. Food logging provides me as a coach with a way to know what going in my client’s mouth. However, it does something even more important than for you. Logging your food holds you accountable and gets you thinking about what you eat and how it relates to your goal. The problem for most people with food logging is that they are really, really busy. The solution: use a photo food log. I first learned this trick from Dr. John Berardi. The idea is simple, when you sit down to eat, grab your phone and snap a quick picture of what you are about to eat. If you go back for seconds – you take another picture. At the end of each day, flip through your meals for the day. Reflect on what you are eating and how your fat loss is coming along and adjust accordingly. Simple and effective! We all have times when we are more susceptible to food temptations. The first step to dealing with this is to recognize when these times are. The second step is to use laziness to your advantage and make eating the wrong foods as difficult as possible. For example, let’s say you do great all day until you come home from work. You are tired and hungry and as you step into your kitchen and start craving a cookie. However there are no cookies because you cleaned out all the junk food from your kitchen. Now, you have three options: 1) get back in the car and drive to the store to buy a pack of cookies, 2) bake some cookies from scratch (after going to the store to buy the necessary ingredients) or 3) have an apple from your fruit bowl that is sitting on your kitchen table. Maybe you find your weakness is at night while you are trying to relax and unwind. You sit back to watch a movie and the ice cream begins to call you. Next time you want to relax in the evening, first go and floss and brush your teeth really well. Then, sit back and relax. When you get those cravings it will be hard to give in after all that effort on dental hygiene. Also, your dentist will be so proud of you! If getting lean is some secret goal of yours, it will be much harder to get to. Instead, build in some accountability systems. Ask some friends or family members to hold you accountable. Tell everyone at work that you are not allowed to eat donuts in the lunch room. If you have kids, I dare you to try this: tell your kids what you are not allowed to eat. They will watch you like a hawk! Or, take it even more public and announce your goal on your Facebook page. If you want to get lean, you need to put in your kitchen time. To make this work and still survive in the real world, you need to do some meal prep. This takes the guess work out of what you will eat during the day and keeps you on track. Meal prep times are even more important than your exercise schedule in sculpting the lean body you want. In my book Athletic Training for Fat Loss, I set up the weekly plans to include meal prep on Tuesdays and Saturdays – even if it means missing the gym – it is that important! Find the best days for you and make it part of your weekly schedule. A while back there was a diet called the apple diet. The idea was you would eat an apple before you ate breakfast, lunch and dinner. It worked for many people because it after eating all that fibre, they ate less. The hungrier you are the harder it will be to make the right food decisions. If you are trying to get lean, you want to consume plenty of protein, vegetables and fiber. This will help fill you up and make it easier to say “no thanks” to all the junk the people try to push at you. It is also important to get sufficient water as some people confuse dehydration and thirst for hunger. When you train a muscle it gets stronger. The same is true for your "no" muscle. The more often you say "no thank you" when people offer you junk the stronger your "no" muscle gets and the easier it is to resist temptation next time. However the opposite is also true. The more often you give in and eat what you don't want to, the weaker your "no" muscle gets and the harder it becomes to say "no". How about you? What else have you found to help you get lean? I invite you to share your comments or questions below or on my Facebook page.